Dear users. We are pleased to announce some new and useful updates! 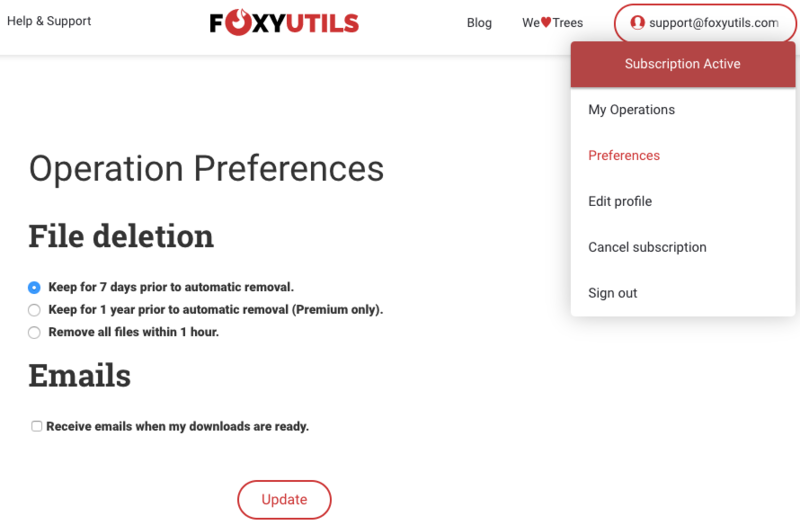 Now you can easily send files directly to your contacts from FoxyUtils. We have added a new feature where you simply put a list of recipients and we send them a download link. We also now send you the download link in email when the operation is completed, so you do not need to wait for it to finish. Then you can simply forward the email to your collaborators. Quick and easy! If you frequently send to the same contacts, we make it even easier by autocompleting the contacts when you start entering the email. As a result of these changes, we are now storing the output files for a longer period. By default the storage time is 7 days. It can be extended to 1 year for Premium users. Alternatively, it can be changed back to storing for only 1 hour max (like previously). The files are stored encrypted on the Amazon S3 cloud which is a highly secure storage provider. You can view and access all your completed operations and common recipients under your profile menu -> My Operations. To change your preferences, including default option for file retainment and enabling/disabling the automatic operation complete email under your profile menu -> Preferences. If you have any comments and suggestions, shoot us an email at [email protected] That’s it for now! Now we’ll get busy working on the next sets of upgrades and new features.